Fat of the Land: The Book Has Landed! 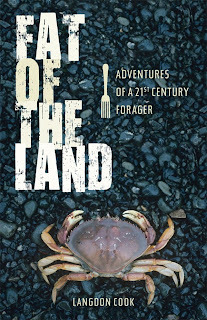 Dear Readers: I'm pleased to announce that my book, Fat of the Land: Adventures of a 21st Century Forager, is now available at a bookseller near you, including Amazon, Barnes & Noble, Powell's, and many independent bookstores across the land. So, what can I tell you about it? The book is 15 chapters, plus an introduction, arranged according to season, with each chapter focusing on a specific group of wild foods and ending with a recipe. Regular readers of this blog might recognize a situation or two, but 99 percent of the content has not appeared here. The book examines the settings, natural history, and culinary lore in greater detail, not to mention the characters doing the foraging. And it's funnier, I've been told. Thanks for your support and I hope you enjoy the book! Looks great - just wondering, how much of the information is specific to the Pacific Northwest, and how much will be of use to me in Northern Michigan? Lang, congratulations! I can't wait to buy and read the book. Thanks for all that you do for Northwest eaters. Hey, cool, I might be able to attend your Portland events. It has landed, and is bloody fantastic. LOVE the book mate. Much congrats! Brad stole my question. Congrats! Very exciting. And I ditto Brad's question, but sub in New England. Have fun Lang...I may catch up with you at one of your events...wish I could make the PSMS but will still be in MT then. Congratulations. This is one I'll be ordering for me and as gifts. Hope you make it to the NY/Phila area on your book tour. We've been looking forward to your book. Congratulations Lang, and enjoy the hectic and awesome authorly experiences of the next few weeks. What an achievement! Thanks for your comments everyone! To Brad, Patrick, Julia & anyone else who wonders whether the book will be relevant to their area, I give you a baseball analogy (sorry if you're not a fan): Think of "Fat of the Land" the way you might about a book-length account of the 1975 World Series. Your city and team might not have been in it, nor your favorite players, but it's a classic worth your time/study just the same. If you're a reader and you like food and the outdoors, I think you'll enjoy the book. I can safely say there is no other book like it on shelves anywhere. Lang, I can hardly wait to get my hands on a copy. Give yourself a big pat on the back for all you've accomplished. Can't imagine how you've been able to keep the blog going at the same time. Well done!! Ciao Chow Linda & Allison: I'll be coming east to the "tri-state metropolitan area" over x-mas holiday to see family. Maybe I can set something up. Suggestions for where in NYC? My wife and I have been enjoying your foraging blog as a supplement to our own effort of growing our own food (www.eattheyard.com) — though mostly vicariously since a lot of your foraging is region-specific. But it's a good read, nonetheless. Your pictures always look great. Anything in the book that might be helpful to San Diego gardeners looking to add a little foraging to their menu? I haven't bought a cookbook in years and years. I've been excitedly waiting for this one for months. I'm going to see if I can get it tomorrow, or at least get my little local bookstore to order it for me. Hey if you plan to tour bookstores in the canadian coast lemme know, you could promote it at our local gulf island bookstore. Congrats! I'll be ordering one for sure. Just finished the book and I absolutely loved it! I have to admit, your blog has been an enormous help and inspiration to getting me started on mushrooming, and the chapters in the book have new recipes for all sorts of goodies I already collect or want to collect. Will there be a sequel? Perhaps a chapter on kayak bottom-fishing? Or Oregon truffles? Kelp? I can't wait to continue reading the blog and continue to learn from you. Where can I forage for porcini in the northeast?